Over the past few years, Thailand has become not only the most popular tourist destination in Southeast Asia – it’s emerged as one of the most popular tourist destinations in the world. In addition, a great number of Western expatriates actually make permanent moves to Thailand. So, why are so many people flocking to this beautiful country? Turns out there are many reasons why Thailand is quite possibly the best country on Earth. The jobs. There’s actually a substantial job market in Thailand, for foreigners and Thai people alike. For example, Westerners can easily find jobs teaching English, doing editing work, or working in sales. It’s relatively safe. Just like any other country in the world, Thailand is certainly not free of crime. However, comparatively speaking, Thailand is actually one of the safest places in the world. Many travelers who have been to Thailand report that they were able to walk around freely (even at night) with no problems. The cost of living is low. So, for instance, even though a Thai salary is substantially lower than those in the Western world, it doesn’t matter – the cost of living is that low. There’s a wide variety of cheap food (and beer!). Thailand is home to some of the cheapest and most delicious food in the world. You can easily eat out at restaurants for three meals a day, and not pay more than $3 total. Thailand also has a plethora of Western food, and other types of cuisine, as well. You can also get a good, tall bottle of Thai beer for a mere $1. Thai people are really, really friendly. American Southern hospitality doesn’t even come close to Thai hospitality. It’s very common to walk through any street and remark that everyone, literally everyone, has a smile on their face. It’s easy to get around. You’ll find that, in Thailand, buses and other forms of transportation run on time, for the most part. The country as a whole is relatively easy-going and organized and not nearly as frenzied as other Asian countries. The climate. 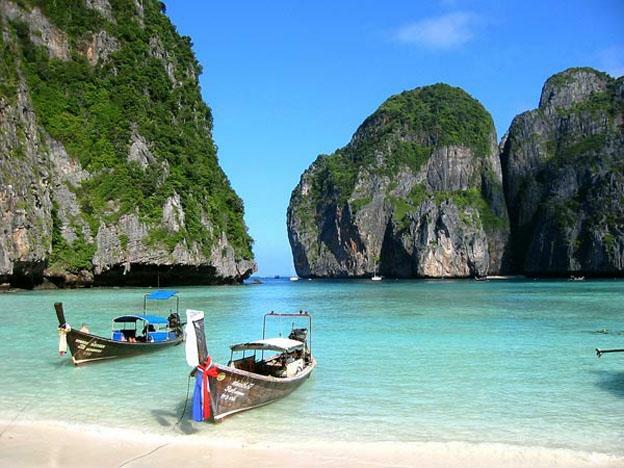 Thailand enjoys a very warm and beachy climate, and almost never gets cold. Things are relaxed. You’ll find it very difficult to be stressed in Thailand. Thais don’t get overly upset about the little things, and there is a general atmosphere of relaxation and carefree happiness most places you go. Entertainment is cheap. Like most other things in Thailand, entertainment is pretty inexpensive – whether it’s going out to eat, bar-hopping, going to movies, or buying books. The cultural diversity. Meaning, when you’re exploring Thailand, you’ll be able to see modernized architecture as well as tiny village structures and temples. The fixed prices. Bargaining for items can be uncomfortable for travelers, but you won’t experience much of that in Thailand. For the most part, the prices of goods are fixed. Thai people are unfailingly polite and unaggressive. You’re not going to hear a whole lot of yelling or see fights in the street in Thailand, especially when compared with other Asian countries. There are elephants. Is it really necessary to say more? The scenery is beautiful. Thailand is home to beautiful waterfalls, mountainous regions, brightly-colored foliage, and incredible beaches – many travelers flock to the country for the sole purpose of exploring its awe-inspiring nature. George, the author of the “14 reasons why Thailand is the best country on earth” is a UK blogger who has recently moved to Thailand. George, also works as expert tour guide for things to do in Thailand.